﻿ Pompeii Porta Ercolano or Herculaneum Gate. Plan of Villas, Tombs and Via dei Sepolcri. Pompeii, Necropoli di Porta Ercolano. Herculaneum Gate Tombs and the Via dei Sepolcri. 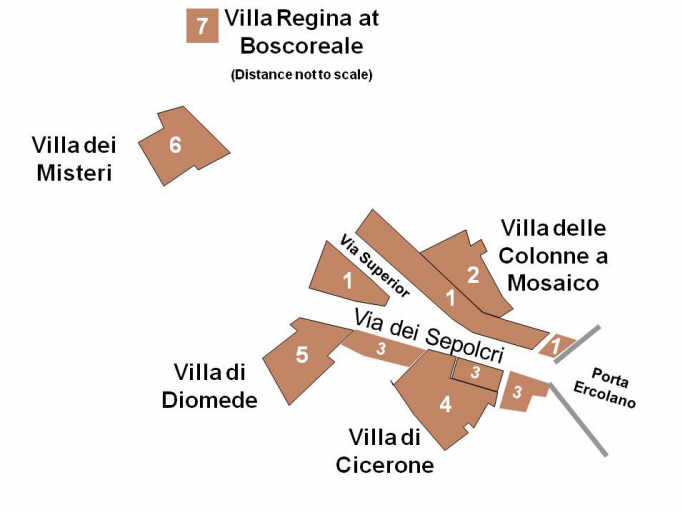 Plan of Villas, Tombs and Via dei Sepolcri. Use this pompeiiinpictures plan to access the photographs of the tombs, shops and villas outside the Herculaneum Gate at Pompeii. The plan also gives access to the pictures of the villas along the Via di Sepolcri and the Villa Regina at Boscoreale. - Kockel refers to it as Nord (the north) side*. - Kockel refers to it as Süd (the south) side*. * See Kockel V., 1983. Die Grabbauten vor dem Herkulaner Tor in Pompeji. Mainz: von Zabern. Each of our pages contains both Eschebach and Kockel references.